As Web Master I have done a bit of wandering lately and have found that the early March Daylight Savings Time (DST) change caused some alienation of Microsoft and Vista compatibility is an issue in buying a new computer. If you did not have Windows Vista or XP on your computer for the recent Daylight Savings Time change you probably adjusted your computer clock manually, as I did, since Microsoft provided no patch (read that no support) for Win98SE and WinME. And the instructions for manually patching Win2000 (as mentioned below) were not understandable by the common man. Businesses had an even tougher time of it than those of us with home computers. Here is an excerpt from my latest StockCharts.com ChartWatchers Newsletter. Microsoft keeps trying to force everyone to upgrade by not providing patches for older Operating Systems but in this case the company has decided to move away from Microsoft and go with Linux. I wonder how many other companies had similar problems and are moving away from Microsoft. but fail to specify if it is the 32-bit or 64-bit version. Reading computer specs online also failed to identify which flavor of Vista Home Premium one would be getting. Logically one would think he would get the 64-bit Vista with a 64-bit machine. I had to make a trip to Circuit City and physically look at the Vista Operating System installed on an HP computer to find out that it was actually the 32-bit version. Now why would the computer makers sell a new 64-bit capable computer with a new 32-bit Operating System? The answer is much better compatibility and thus less support calls to the computer makers. Here is an excerpt from Paul Thurrotts Supersite for Windows which explains the situation. You can read the complete article at http://www.winsupersite.com/showcase/winvista_ff_x64.asp. So since 64-bit device drivers are in short supply and all of us would like to continue using our existing 32-bit applications and perfectly good peripherals like printers, scanners, etc. I can understand why the computer makers are making a compromise by bundling the 32-bit versions of Vista with new 64-bit machines and hoping to entice at least some of us to the new Operating System. At present I am still undecided as to if I want to make the leap. Editors Note: Curt finally got off the dime and ordered a new computer online. His description of his experience so far with that follows. Have been playing with my new HP a1710n Vista Home Premium computer off & on this week so thought I would give you an update. I then removed Norton Antivirus & Internet Security and installed AVG, Firefox, Thunderbird, IrfanView, Belarc Advisor 7.2k. Next came the auto downloading & installing of 11 Vista updates (23MB). Getting my Mozilla Address Book and Bookmarks put into Thunderbird and FireFox took some doing as they apparently use different file extensions and formats from the Mozilla Browser Suite (which I use on my other computers) but I finally got that done. Have not figured out yet where Firefox & Thunderbird bury that info. The Portable Apps (with Open Office) work fine off the 1GB Thumbdrive. The computer came with Microsoft Works 8. Checked out the Works Spreadsheet program using the Excel extension xls & it is compatible with Easy Offices spreadsheet but I had an incompatibility in the date column formatting with Open Offices Spreadsheet but that may be just a minor glitch as I have used the Open Office Spreadsheet and Easy Office Spreadsheet files interchangeably with no problem. I found that Vista recognizes DivX files when I put a DivX DVD in the DVD burner and commercial DVD movies play fine. Vista had to go to the web to download & install drivers for my HP880C printer but that went smoothly. The fun has been trying to find the old things like monitor screen resolution. Had to change my 1996 vintage ViewSonic 17-GS-2 17-inch CRT resolution and refresh rate from what Vista had it defaulted to (1024x768 with refresh of 60Hz) but again no biggie. Display Settings are now in Control Panel under Personalization. Am now running 1152x864 with refresh of 72Hz at 32bit color. Highest screen resolution the computer apparently supports is 1280x1024 so if I wanted to get a 19-inch widescreen LCD monitor with a native resolution of 1440x900 might have to get a new Video Card. So far no problems. All seems to be working well. Am finding my way around Vista slowly. Graphics. Since I am not a gamer that is no biggie for me. A new discreet Video Card replacing the onboard graphics of the motherboard would solve that problem. The only other marginal subscore is 3.2 relating to Windows Aero performance graphics. The Vista Aero Graphics experience seems to work fine as far as I can tell. Here is a real brief explanation as to what the base score means. It is explained in more detail in Vista. 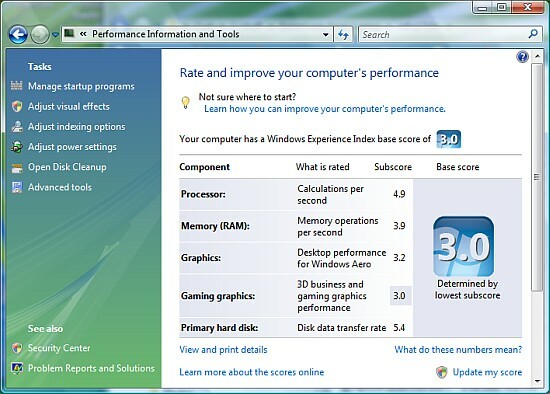 A base score of 1 or 2 usually has sufficient performance to do most general computing tasks but generally not powerful enough to run Windows Aero. A base score of 3 is able to run Windows Aero and many new features of Windows Vista at a basic level but might struggle to play High Definition TV content. A base score of 4 or 5 is able to run all new features of Windows Vista with full functionality. So in conclusion I am quite happy with my new Vista Home Premium computer. The computer appears to be very fast. One thing that impressed me was doing a search of the hard drive is instantaneous. Before I finish typing, the answers are displayed!